Hisenberg’s Uncertainty Principle doesn’t give us free will, it just allows a chance that the otherwise set ‘decision’ we would have made may be changed. uhhh… There is no difference between those two statements. If there was a set course of action that would always happen under certain circumstances then we would have no free will. We would always make the same decisions under the same circumstances. We would have no free will. Because of the Uncertainty Principle we make a decision that is not predetermined in any way. Therefore we have free will. 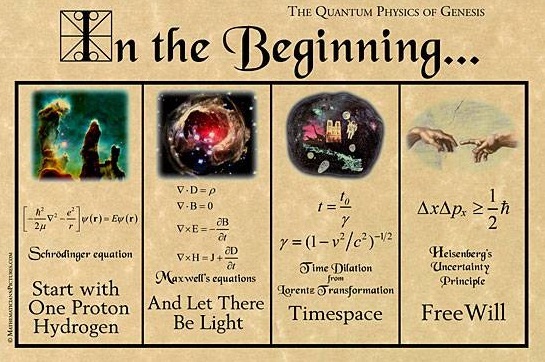 unfortunately for you there is no god… just the equations. In fact there is god and this equation is just theory. Matter cannot be created or destroyed? ever? except for… this time. um no. Science doesn’t prove faith. it does not prove an unconditional love that never dies, and it does not prove an explosion creating creating everything. It is a lie to distract you from the truth and glory of God. If you were actually educated you would realize that all the things you said science didn’t prove have already been proven. We live in a zero energy universe. Therefore the big bang is proven. Energy(which matter is a type of) is never created nor destroyed EVER there are no contradictions.